The Andaman Sea or Burma Sea is a body of water to the southeast of the Bay of Bengal. It is south of Burma, west of Thailand and east of the Andaman Islands, India. It is part of the Indian Ocean. The sea has been used for fishery and transportation of goods between the coastal countries. Its coral reefs and islands are popular for tourism. Many building were badly damaged by the 2004 Indian Ocean earthquake and tsunami. The average depth of the sea is about 1,000 meters (3,300 ft). The northern and eastern parts are shallower than 180 meters (600 ft) due to the silt deposited by the Irrawaddy River. This major river flows into the sea from the north through Burma. The western and central areas are 900–3,000 meters deep (3,000–10,000 ft). Less than 5% of the sea is deeper than 3,000 meters (10,000 ft). In a system of submarine valleys east of the Andaman-Nicobar Ridge, the depth is more than 4,000 meters (13,200 ft). The sea floor is covered with pebbles, gravel and sand. The coastal areas of the Andaman Sea have mangrove forests and seagrass meadows. The mangrove roots trap soil and sediment. They provide shelter and are a nursery for fish and small aquatic organisms. Their body protects the shore from the wind and waves. Their detritus are a part of the aquatic food chain. Other important sources of nutrients in the Andaman Sea are seagrass and the mud bottoms of lagoons and coastal areas. Many aquatic species move from and to seagrass either daily or at certain stages of their life cycle. The sea waters along the Malay Peninsula favor molluscan growth. There are about 280 edible fish species belonging to 75 families. Of those, 232 species (69 families) are found in mangroves and 149 species (51 families) live in seagrass. 101 species are common to both places. The sea also has many vulnerable fauna species, including dugong, several dolphin species, such as Irrawaddy Dolphin and four species of sea turtles: critically endangered leatherback turtle and hawksbill turtle and threatened green turtle and Olive Ridley turtle. 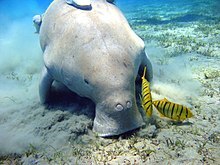 There are only about 150 dugongs in the Andaman Sea, scattered between Ranong and Satun provinces. 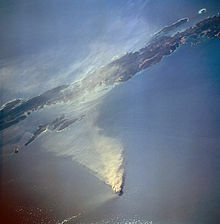 Eruption of the Barren Island volcano in 1995. Andaman islands (on top) are ca. 90 km away. To the east of the main Great Andaman island group, is Barren Island. Barren Island is the only presently active volcano associated with the Indian subcontinent. This island-volcano is 3 km (2 mi) in diameter and rises 354 meters above the seal level. Its recent activity started again in 1991 after a quiet period of almost 200 years. The last eruption has started on 13 May 2008 and still continues. The volcanic island of Narcondam which is further to the north. No records exist of its activity.